We've got some exciting news: we've just set up our PlannersWeb company page on Linkedin as a way of providing you with a brief daily update on a key planning-related news story or report we think you'll find of interest. 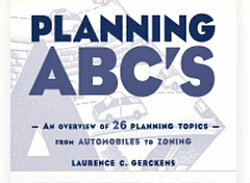 What’s more, we’ll also provide you links to related articles we’ve published here on PlannersWeb. Again, the updates will be very short. We urge you to go to our company page and take a look at our first few updates. Be sure to also click the yellow Follow button in the upper right corner of the page. We will continue to add Discussion items on our PlannersWeb Linkedin group page -- if you’re not familiar with our group page, take a look. Note: we understand that some municipalities bar their staff from visiting social media sites, including Linkedin, at their office. While we regret those policies -- which prevent access to useful information -- we suggest that you access our Linkedin pages from your home computer. You might also want to inform your municipality’s administrator of the value of accessing our Linkedin pages from your office. Each has a different use.